ABC’s American Crime review: This is the most nuanced, intelligent take on race relations we’ve seen in years. This new ABC drama is the most nuanced, intelligent take on race relations we’ve seen in years. A scene from American Crime. American Crime, the impressive and somber new drama series written by John Ridley, the screenwriter of 12 Years a Slave, begins with a dreaded phone call. Robbery-homicide officers in Modesto, California, wake Russ Skokie (Timothy Hutton) in the middle of the night and tell him he needs to fly there immediately to identify what they believe to be the remains of his son, Matt, who appears to be the victim of a home invasion. Russ arrives that morning, gazes on his son’s corpse, learns Matt’s wife, Gwen, is in a coma, seemingly the victim of sexual assault, and asks to use the restroom, where he sobs loudly, like a wounded animal. 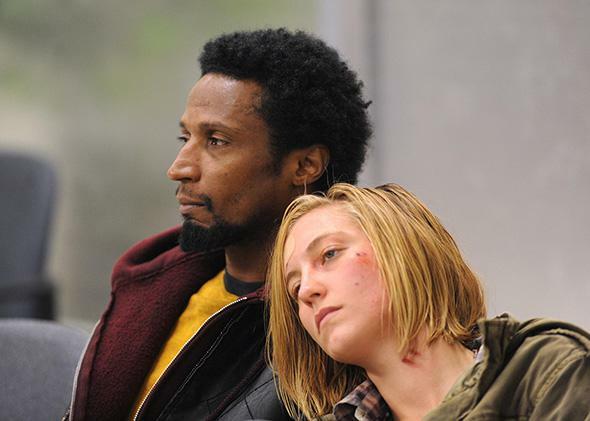 It’s a blunt, immersive introduction to American Crime’s tough emotional palate. The series is one of the first network dramas in a cable mode that that does not feel seriously reduced, stupefied, or broadened by its network address, and that means the viewing can be very tough going. Matt Skokie’s murder sets the series’ plot in motion, but not by turning the show into a whodunit. American Crime eschews the propulsive, entertaining genre beats of a mystery show: None of its main characters are detectives, lawyers, or crime-solvers of any kind. The title, American Crime, does not refer to any one act but a host of them, including Matt’s death; the lesser crimes surrounding it; the crimes in prosecuting it; and, hovering above it all, the crimes of prejudice and racism and their distinctly American flavors. It’s a reflection of the show’s philosophy that the seemingly happily married white couple whose murder and assault kicks off the series remains largely mysterious and unknown: Matt and Gwen would be on the front page of the paper, but they are of the least interest to American Crime’s writers. Instead Matt’s death acts as a kind of dragnet, grabbing up a number of disparate characters that the show follows even as the immediate ramifications of the murder fade from their lives. Those characters include Russ’ rigid, racist ex-wife, Barb (Felicity Huffman); Gwen’s parents, Tom (W. Earl Brown) and Eve (Penelope Ann Miller); widowed Mexican American garage owner Alonzo (Benito Martinez, who abruptly left House of Cards this season, probably for this role), his teenage son, Tony (Johnny Ortiz), and daughter, Jenny (Gleendilys Inoa); two lovebird meth-heads, the white Aubrey (Caitlin Gerard) and the black Carter (Elvis Nolasco), whose sister Aliyah (Regina King) is a devoted convert to Islam; and Hector (Richard Cabral), a tattoo-covered gangbanger from Mexico. All of this, as you can probably surmise, could very easily slip over into the territory of Crash, the hackneyed, pious Best Picture winner in which characters were stand-ins for hoary insights about race. It is true that American Crime, like Crash, is a kaleidoscopic look at racial relations, which do come up in every single storyline (and sometimes as ridiculously as a pair of junkies lining their apartment with aspirational biracial photo shoots). But Ridley’s insights are, generally speaking, much more complicated and nuanced than Crash’s, which ultimately came to the banal and head-scratching conclusion that everyone who seems racist deep down is not, and everyone who doesn’t probably is. In the most powerful storyline of the first four episodes, Alonzo arrives at the police station where his son, Tony, is being questioned. Alonzo insists that Tony, who has been bridling under his father’s overprotection, tell the police everything. Tony does and is afforded no protection under the law. No one can quite believe that Alonzo didn’t get his son a lawyer. “White cops, interviewing a brown boy, and you didn’t do anything?” his brother-in-law asks. Did Alonzo just want to please the police officers, to prove he was not like “them”? Or was he acting like a good father and citizen of any color, expecting honesty from his son and good faith from law enforcement? Wasn’t, after all, Tony behaving like any teenager? But what if expecting such good faith from the cops, while brown, makes one a decent citizen and also a negligent parent? Alonzo is trying his best, but the system isn’t just rigged—it’s quicksand. This question of how to protect your children, imperfect as they are, also occupies Matt’s and Gwen’s parents. Gwen’s father, Tom, becomes fixated on his daughter’s sexual proclivities and increasingly disgusted with her, even as she lies in bed in a coma. Tom’s not in denial, but his love is increasingly conditional, which makes him a counterpoint to Barb, who goes into a kind of emotional lockdown. She will hear nothing ill of Matt, even if that involves living in a fantasy world about his lifestyle. Huffman, with the most abjectly racist role in the series, is excellent playing a character who is both awful and in real emotional pain. She makes herself detestable and pitiable at the same time, a mother who really does love her children, however limited she may otherwise be. And as prejudiced as she is, it’s not all that she is—which is the key to avoiding the Crash trap. She is motivated by a sense of herself as single mother, survivor, and protector, the one person looking out for her kids, however delusional that may be. Of all the series this season to take on race and diversity— Black-ish, Fresh Off the Boat, Empire, How to Get Away With Murder—American Crime is the most serious-minded. It has no sense of humor to speak of. It’s relentlessly focused on its themes. It can be harrowing and bleak. But what it lacks in fun, it makes up for in intelligence, complexity, and boldness. It’s a network show about heavy, difficult, uncomfortable topics, and it expects, quite simply, an audience. It deserves one, too.